Below is in my personal opinion, what every newly diagnosed Celiac needs deserves to have at their fingertips. $9.95 for non-members it's a bargain. Per the CSA - "This pocket-sized dictionary was developed to help people with Celiac disease and gluten sensitivity to select acceptable foods and understand food ingredients so that they may avoid foods containing gluten. It provides a brief description of each item along with an assessment of its acceptability for the gluten-free diet." 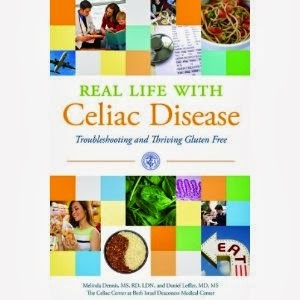 An informative book on Celiac Disease such as "Real Life with Celiac Disease" by Melinda Dennis and Daniel Leffler. This is a great book for those who are unfamiliar with Celiac or want to educate themselves further. Check out a free basket that the University of Chicago Celiac Disease Center offers the newly diagnosed. This is a great way to set people up for success as it contains many essential items that will help alleviate the overwhelming feeling of uncertainty that most of us feel upon diagnosis. You can find these almost anywhere that sells books now. Pretty awesome! 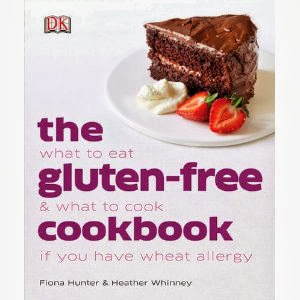 One of my favorites happens to be the DK Gluten-Free Cookbook. Check out my tips for finding a cookbook full of recipes that will work for you here. While there are many of them out there, it is worth investigating to find one that is suitable. Support groups can range from in person gatherings to "pages" on Facebook. Take this with a grain of salt as they only offer the support that members are willing to put into it and can often be a pool of misinformation at times. Rest assured that there are indeed legitimate and helpful groups out there. I suggest starting with either the NFCA or CSA to find a local group or page that is helpful.